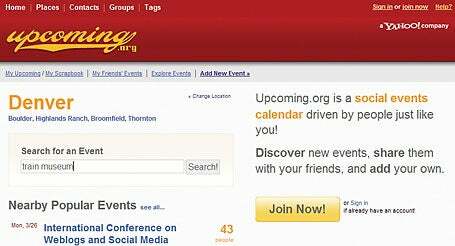 Events site Upcoming.org may not list as many events as other sites, but its community members are far more social. Finding something to do on a Friday night has long been a process of searching your local newspapers or subscribing to e-mail lists of bands or theaters. Now a trio of startups are attempting to make finding events and adding them to your busy social schedule easier. Winner: Yahoo's Upcoming.org has listings from around the world thanks to its devoted users, who add tons of local events, as well as to the recent inclusion of events from Yahoo Local's listings. Upcoming has a social networking feel, and every event has a listing of users who say they plan to attend. You also can click on a user's name to see what other events that person plans to attend. While the site feels both basic and cliquish, it is the most active events site on the Web. Despite the addition of millions of Yahoo Local listings, Upcoming found only 28 listings for San Francisco art openings on the weekend we checked (Zvents found more than twice as many). Still, adding events to your calendar is simple, and Upcoming offers e-mail and text-message reminders. Runner-up: Zvents has the most full-featured and user-friendly event service on the Web. The site offers a search engine that understands terms such as "this weekend," descriptive listings, and an embedded Google map. With just a simple click, Zvents' great interface permits you to add events to your Zvents calendar, or to your AOL, Google, Outlook, or Yahoo calendar. Users also can invite people to events, add them to a group calendar, and easily post events to a blog. A search for "art opening" in San Francisco on one weekend showed 68 relevant matches. Unfortunately, Zvents relies mostly on user-submitted events in most cities, and few users comment on events. Expect Zvents to take off once it automatically populates listings in other cities. Also-ran: Eventful, another San Francisco Bay Area-based startup, has deep listings, but the search function is too literal: A search for "rock" in San Francisco over a whole week uncovered merely eight listings, only one of which was actually a rock-and-roll performance. One plus: Eventful supports Microsoft's innovative Live Clipboard service, which allows you to cut and paste event data between Web sites.